It's glassy on what is frozen up north. After seeing Chris's video and hearing word from elsewhere..... 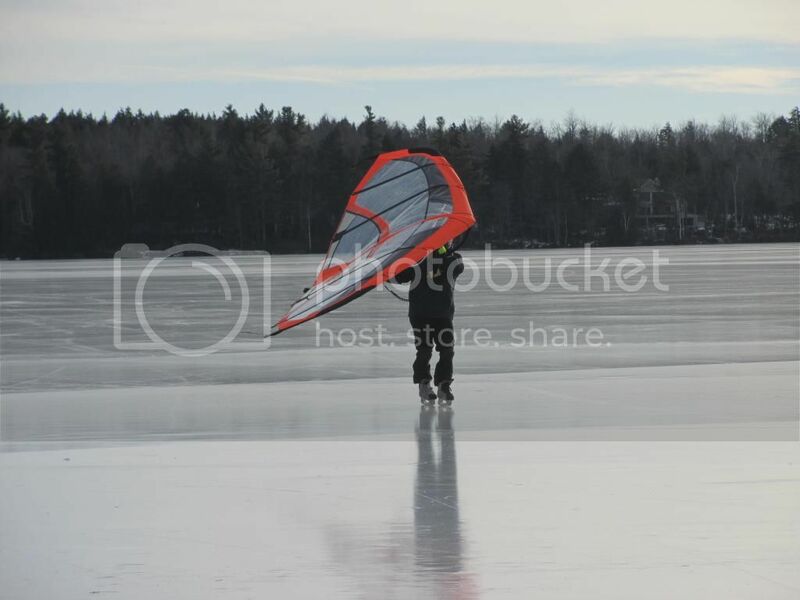 I went up to NH on smaller Lake and rode on my Hockey skates w/ 3.8m Mod. aspect FB. Blades were dull bad still had fun. Wind 6-15 mph. Lots of Kite wingers there. Tried my first kite wing at end of day. fun and different. No lines to run over! The learning curve for using a kite wing is way shorter than a kite. Get it while you can. Nasty weather will coat ice with thick layer of snow/rain/ice crust by Sunday. Say hello to Skis . Those wings are pretty fun. You adding one to the list if needs? Rick-who I guess let you try his- was up there. Today I went back across state lines to same lake for more. Drove thru snow squall cells, but not even a dusting. Yesterday was actually tough because I brought up a dull pair of blade with significant limited edge control. This limits fun. Today I went back with a new pair of freshly sharpened Softec Hockey skates. This are most comfortable skates I ever wore as the are thick foam lined-Tongue and main body...like putting into an inner ski boot liner... but it's a one piece design. The wind was howling fairly regularly when I arrived..30+mph and may a few times have hit near 40, as a later gust- after returning and sitting in car- shook my car pretty good! Overall it was 12- 35+ mph at any time. Up and down. Not a racing kite selection kind of day. There were several Kite Wing flyers again... Using smaller sails today (4m or less...instead of 5 or 6m). The gusts may have made it hard for a few. I saw several 'take downs' from the wind and slides on torsos from the falls. One gave up. Later another. But I had it 'dialed in', it seemed. Sharp skates made it Soooo much more enjoyable today ..but also so did having the right kite. Much of the day I did not hook in as a cautious safety step....a few gusts caught my full attention a bit... and though nothing happened.. I thought, "I should unhook, maybe..'... in case, say some more gusts of 40mph-or more come along and want to yank me from the present. Hooked in I felt fairly comfortable and safe, but just thought I would be extra safe for- not all- but many runs anyway. I guess the thing about the 2m flow is, though it can accelerate to high speeds in high winds...... it does it more gradually than higher aspect kites. And by it' s small size and shape..... the 'grunt'- as the say- is low. Thus... why I feel in control, and also why I can fly unhooked(superman style) with full pull on my arms, and do it all day practically. A day of some fast speed runs on excellent ice. My kite line **broke late in day, and though I had another 2m(good to have back up)..it was late , was hungry and beat down a bit from wind chill, so gave I packed up kite gave up. ... There is a story of a huge piece of ice that fell from a cliff in Tuckerman Ravine on Mt Washington where people hang out below slope and eat lunch. People have been killed by being hit by ice chunk. But on this day the ice chunk hit some rocks-where they sat ..'exploded' into shrapnel and cut many people with fresh sharp pieces of ice. No one was killed and no major injuries... but the Snow Ranger said the white snow slope had many stains of blood spots from the people cut by ice shrapnel glancing off them. Hard to believe, I thought. 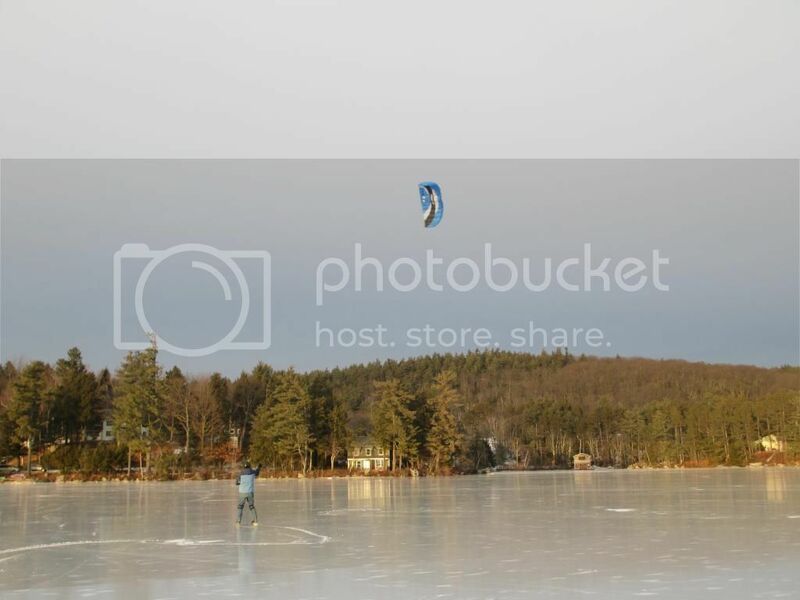 Maybe there will be snow kiting with more snow next week? They're saying its gonna be super honkin cold up in the northern half of the country over the next few days. Any hopes for a good freeze plus snow? Jack frost and Mr freeze holding all week rave over northeast! The ice is thickening as I write this and probably I will be out on it in a couple days. I see a little snow potential ...not much... but I see winds...and ice. I will be chopping test holes from shore next couple mornings. The lake is in a populated suburban town and has street traffic going around it..and has walkers/joggers. Either the police decide to initiate contact after seeing me on ice from rd.... or a concerned bystander walking calls and reports to them someone is out on ice.. Anyway..so this time I go over back to shore to talk to officer as I know the theme of the conversation-as always- will be 'is it safe for you to be out there?.. He asks what I am doing, and I skip the kiting part to just say testing ice to go skating- cause it's easier to not have to explain 'kiting'...nor do I have to. But then the police officer makes up a story of someone reporting seeing a person break thru and fall in the ice earlier in day. How do I know he's lying?..Without getting into many details of why I know he made it up (the ice was safe and thick)....let's just say he just wasn't a good fabricator or actor, and his odd presentation and lack of detail-never mind his tone(he wasn't believing himself!) -belied his story. I understand his concern for my safety... but I had explained I just don't go on ice without testing and bringing rescue picks. But try and respect me and don't make up a story. That's not the way to do things. Visits from his other ' brothers' were totally warm and respectful. As always , he admitted can only warn me and can't make me get off the ice...but only after suggesting to me ,maybe I should get off ice. I said, something like, " thanks, I appreciate the concern...thank you,I'm fine......I'm going to skate. I'm gonna get my ax now if it's okay and go..okay? "Yeah..sure...but can I get your name? ", he said ..and I said "no...I rather not..and we parted. Such is Kite skating/skiing in the suburbs..sometimes! The Sheriffs in my county are friendly and usually enjoy watching. I usually stop and talk with them and answer questions. Although, I'm not on the ice so it's not a good comparison. I'm sure they would have more to say if I was on the ice, especially in my area because the ice usually isn't thick enough to be on. I'm in that in between region where we are always on the edge of being barely thick enough to not thick enough.